For centuries many people use blueberries as an effective instrument for visual acuity and color perception improvement. During World War II, almost all flyers used bilberry extract to improve vision and reduce eye strain. Today vision problem does not lose its relevance because of the increased eye strain problems - work on the computer, TV screen, etc. Bilberries contain biologically active substances such as anthocyanin, microelements, organic acids, vitamins - C, PP, B1, various carotenoids, triterpenoids, phenols and their derivatives, catechins and flavonoids. Flavonoids and catechins improve strengthening of the vascular wall, as well as stimulates biosynthesis. These compounds have a stimulating effect on the recovery processes and besides these are powerful antioxidants. Numerous experiments and clinical researches have confirmed that blueberry extract can improve the regeneration of the light-sensitive retina pigment – rhodopsin, improve retinal nutrition, stimulate microcirculation as well as restore the mechanisms of retinal tissues protection. Bilberry extract can help not only to preserve vision, but also significantly improve vision and strengthen adaptability. 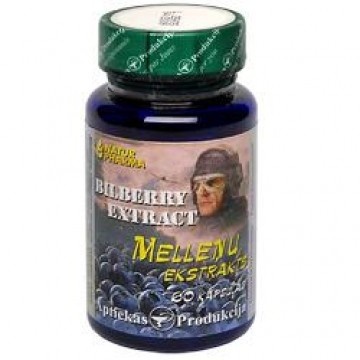 Eyewell bilberry extract contains a very large dose of active blueberry extracts.